Veg Pulao is easy to make and if you mash it up with essential veggies, it can be a highly nutritious meal. 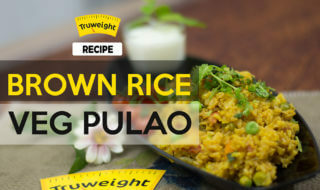 Truweight, in its own inimitable healthy style, shows you how to make a very healthy brown rice vegetable pulao. The best part of this dish, you can add any and every vegetable you want and also reduce the amount of brown rice! Brown rice is brown because it doesn’t undergo the harsh refining treatments. This means the hull and the bran are still kept intact. Because of this quality, brown rice is are rich in proteins, thiamine, calcium, magnesium, fibre, and potassium. Now that we have told you about the benefits, we are sure you will only prefer brown rice veg pulao over the regular one! For a better taste, you could use brown rice basmati. Heat oil in a pressure cooker and add cardamom, cloves, cinnamon, black pepper, bay leaf, ginger garlic paste, green chilli and onion. Mix them well. Add tomato, cauliflower, green peas and carrot. Mix them further. Now add turmeric powder and chilli powder to it. After mixing them well, add soaked brown rice with required amount of salt and water. Cook well and then add amchur powder, garam masala and coriander leaves to it. You are ready to serve your Brown rice veg pulao.